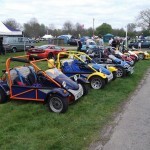 The Blitz KR2 is the latest high performance single seater road legal kit car from Blitzworld. The buggy is available factory built ready for the road, or in kit form. The Blitz KR2 chassis comes complete with it own exclusive detachable rear sub-frame allowing other engines to be easily fitted including bike engines. Due to the options available on Building the KR2, Blitzworld have split up all the parts allowing you to select just parts you need for your own custom build if you want to use a different engine than the K-Series, like a bike engine. The Blitzworld KR2 is specifically designed for the popular Rover K-Series engine that has proved very popular in many kit cars to date. 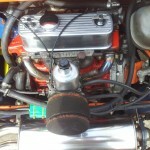 The two main engines readily available for the build are the 1.4cc 24v or 1.8cc 24v engine, offering a light compact engine and gearbox delivering up to 150 bhp (1.8 16v engine), in a buggy weighing in at less than half a ton. The acceleration due to the weight loss is on a par with motorbike performance, with a top speed over 140 mph (1.8 16v engine). The design criteria for the Blitz KR2 was for a high performance buggy for ON and OFF road use and able to be modified to allow other engines, like bike engines to be easily fitted into an already proven road legal buggy. To do this the rear end of the Blitz buggy was totally redesigned for a multi engine option, allowing a spare engine to be fitted to a second sub-frame and then just bolted into place when required. This offers the user easy maintenance of the buggy engine. 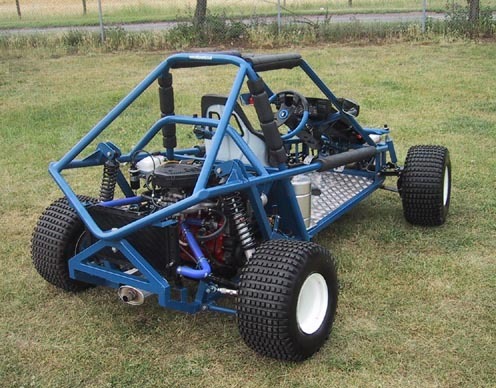 Due to the flexibility of the KR2 it is well suited to grass track or hill climbing due to the mid mounted engine, and engine options available. The rear suspension for the Blitz RR2 was totally redesigned and based off a competition racing car design to give maximum stability of the buggy at high speed both on and off the road. The top wishbone is fully adjustable by the twist of a spanner to alter the camber of the rear wheels. The coil over shock absorber is also fully adjustable to give different ride heights and stiffness. 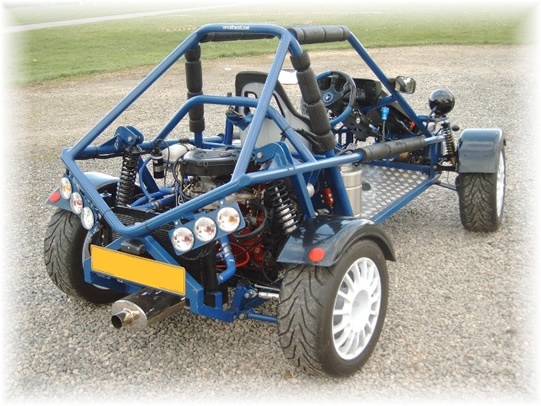 The Blitz KR2 boasts a very powerful 1.4cc 16v Rover GTi engine with 104 bhp as standard, or the Rover ZR engine 1.8cc 16v @ 140+ bhp, and placed in the rear of the Blitz chassis makes this buggy one of the fastest multi build and multi engine kit based buggies on the market today. Due to the power to weight ratio engine modifications are not required, as this vehicle will far exceed the national speed limit without hesitation. The 0-60 mph is on a par with Bike performance, but bearing in mind that the buggy only weighs about 350 Kgs, that is like 400BHP / ton + in standard unmodified form. The nature of the design of the Blitz KR2 places the driver in the optimum position for balance - front to back and side-to-side. Due to the integrated custom built rear suspension and the use of a transverse leaf on the front gives the Blitz KR2 handling like no other vehicle on the road. The power is put down onto the road with custom-made Compomotive TH3 rally wheels and TOYO Proxy R888 tyres that offers the best handling possible in the dry. With the design of the rear engine bay, different engines can be easily placed into the Blitz KR2 giving the user a range of engines for different race or road applications. The rear chassis assembly will accommodate most popular car and bike engines, allowing you a very high revving buggy. Blitzworld have got an exclusive insurance deal with Adrian flux who are currently offering insurance on the Blitz KR2 (1.4 16v engine) based on driver over 30 of only £125 fully comp for year, see links page for insurance companies details. 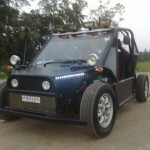 This makes the Blitz KR2 one of the cheapest high performance buggies on the road. The following list includes all the other parts required to build the Blitz KR2, but we have put them as optional parts. Due to the nature of the Blitz KR2 there many build options available. The following list itemises some of the major parts required to build the Blitz KR2 and the associated options available. These are only required if you are fitting the K-Series Rover engine & gearbox. Blitzworld can supply these as brand new components. This is for the K-Series engine and works in-conjunction with the aluminium petrol tanks. For other engines different pressure pumps may be required. The KR2 offers a single or twin aluminium petrol tank system capable of holding 2 or 4 gallons. 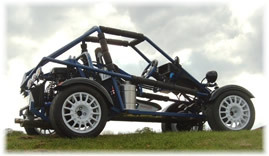 For road use we recommend the twin 4 gallon system giving the buggy over a 100 mile range. Carbon fibre mudguards are available for the Blitz KR2 that are suitable for the compomotive 15” TH3 wheels with the 205 wide tyres. The current SVA rules states that if the wheels stick out from the bodywork more than 9mm then mudguards need to be fitted. Thus is there is no bodywork on the buggy then you do not have to fit them, but we recommended you do fit them. This kit includes all the lights you need to put the KR2 on the road. It also includes all the necessary fixing brackets, pre welded to the chassis. The Blitz KR2 comes with a steel floor as standard, but is upgradeable to an aluminium checkerplate floor. Please note the aluminium floor option is built into the buggy on manufacture and is not available as a later upgrade for self fit. We have currently got a STS absorptive exhaust (straight through) that just bolts directly to the existing front manifold and is suitable for road use. You will have to retain the catalytically converter that is fixed onto the front down pipe to meet SVA regulations. If you are upgrading a Blitz 1, then you can get rid of the catalytically converter as a Fiat 126 donor car did not have one. The Rover engines suffered from poor cooling, this was due to the quality of the radiator. We found that all the radiators including brand new disintegrated very quickly and were not sufficient at cooling when the buggy was being pushed to its limits. Blitzworld have now designed a brand new aluminium radiator that fits all across the rear of the buggy offering a twin fan and more efficient cooling at high speeds. This is suitable for the 1.4, 1.6 & 1.8 multi point injection engine. · ON ROAD - This is a full plug in loom that connects to the KR2 standard light kit.